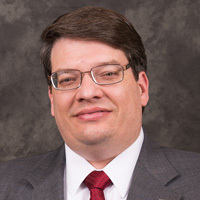 Webster University's vice president and chief financial officer, Greg Gunderson, has been named the new president of Park University in Parksville, Missouri. He begins his new post on Jan. 15, 2016. Gunderson started at Webster in March 2011 and served on the administrative council, provost’s council, and worked closely with the president, provost and the board of trustees. “I have always considered myself a different kind of CFO,” Gunderson said. "I think, in part, that played a role in my selection. I wanted to be part of the academic solution and not just a bean counter. President Stroble and Provost Schuster gave me that chance and helped me to grow and develop. My time at Webster University has been the greatest joy of my career; to be part of a management team that puts student success and quality learning experiences first and foremost in all that it does. I know when I come back in the future to celebrate the many successes in the future of Webster University I will be able to see my impact in many of the improvements we have undertaken in my time here; from a more accessible public safety team, to new and renewed buildings across the globe, to an expanded and empowering endowment. I hope to use this foundation in this new adventure as the president of Park University." Gunderson’s last day with Webster will be Jan. 14, 2016. Members of the Webster community are invited to a farewell reception for Gunderson on Wednesday, Jan. 13, from 1-3 p.m. in the East Academic Building, room 253/262. RSVP to Nancy Higgins at higgins@webster.edu.